2014 was an incomparable year for Spanish cinema. The Spanish film industry started to show signs of recovery from the harsh blow suffered as a result of the economic crisis and the VAT tax rise (from 8% to 21%) imposed by the Conservative Government. This rehabilitation was visible at this year’s Goya Awards where, for the first time in several years, there wasn’t just one clear favourite but a few strong contenders. Andalusian director Alberto Rodriguez achieved a considerable victory over the other nominees by taking home a total of 10 Goya awards for his film La isla mínima, including Best Film and Best Director. La isla mínima takes place in Southern Spain in 1980. Two sisters have vanished from a tiny village near the marshlands of the Coto de Doñana, a National Park near Seville. Two detectives are brought in to investigate the teenage girls’ disappearance; Pedro (Raúl Arévalo) is a young detective from Madrid who has been removed from his position in the capital due to his outspoken left-wing political views. Juan (Javier Gutiérrez) comes from a more right-wing conservative background, having served in Franco’s own police force. As their investigation moves forward and the battered bodies of the two girls are found in a nearby swamp, Juan and Pedro discover that there is much more to this case than first appeared. La isla mínima is a dark, nail-biting thriller, very much along the same lines as Enrique Urbizu’s La Caja 507. This movie works on many different levels and it is in this complexity where its main appeal lies. It would take at least a couple of viewings to fully understand the intricacy of its different layers. The acting is superb, with special mention to Javier Gutiérrez whose portrayal of the Francoist policeman is undoubtedly his best role, and one of 2014’s finest. 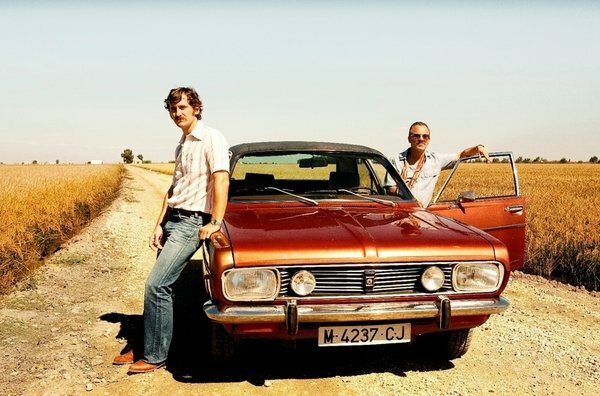 At a deeper level, La isla mínima succeeds in portraying Spain’s transition to democracy – a country at the crossroads between a Fascist Dictatorship and a Democratic Monarchy. Franco’s portraits and symbols are still hanging on some of the characters’ walls and, at one point, we see Pedro tear a crucifix from the wall of his hotel room. The contrast between the two Madrid policemen and the poor, agricultural community in this Southern Spanish town serves to outline the disparity between the country’s past and its imminent future. La isla mínima delivers an enthralling story while creating a verosimile, stereotype-free historical context. For me, however, it is a stunning cinematography which makes La isla mínima even more idiosyncratic. Alberto Rodríguez has deliberately incorporated the style of two very different photographers in his movie. On the one hand, the black and white photographs of Atín Aya, a Sevillian photographer who portrayed the harsh life of the Andalusian working classes during the second half of the 20th century. On the other, Héctor Garrido‘s magical aerial shots of Coto de Doñana, which serve as a beautiful opening, accompanied by Julio de la Rosa’s enigmatic soundtrack. The contrast of the fascinating but hostile nature of the Guadalquivir’s marshlands more than enhances the moral ambivalence that emerges from enjoying a wonderful film about such horrendous events. La isla mínima – English trailer.